The traditional turkey and cranberry sauce holiday meal takes a back seat with this holiday prosciutto appetizer. 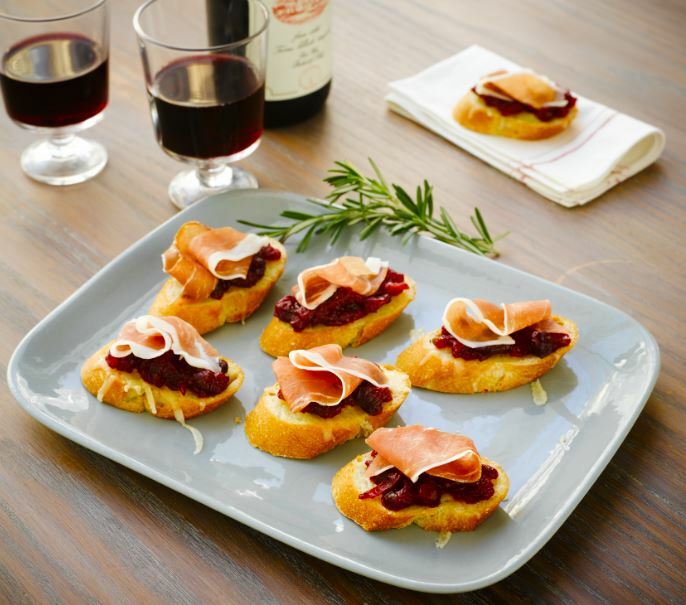 The tart cranberries paired with sweet Prosciutto di Parma and savory Montasio cheese will have you and your friends eating these crostinis all night long. Bursting with flavors perfect for the holidays and creating a new take on a traditional classic, this prosciutto appetizer is sure to be loved by adults and kids alike – just be sure to make enough for everyone to enjoy. Pair with a bold red wine to bring out the rich flavors further. Slice baguette into 24 rounds about 1/2-inch thick. Place rounds on a baking sheet and drizzle lightly with olive oil. Bake until toasted, about 5 minutes. Remove from oven and let cool. Divide cheese on top of the toast rounds and return to the oven. Bake until the cheese has melted, about 5 minutes. Top with a thin layer of cranberry compote, then place 1/2 slice of prosciutto on top. For the cranberry compote: Rinse and drain well a 12-ounce bag of fresh or frozen cranberries. Melt 3 tablespoons butter in a medium sauté pan over medium-high heat. Stir in the cranberries, 6 tablespoons light brown sugar, 6 tablespoons maple syrup, 1 tablespoon grated orange rind, 1/4 teaspoon ground cinnamon, and 1/8 teaspoon salt. Cook, stirring occasionally, until cranberries start to break down and mixture thickens, about 8 to 10 minutes. Set aside to cool.